[prMac.com] Redmond, Washington - HipSoft is excited to announce Flip Words HD for iPad and Flip Words 2.0 for iPhone are now available in the App Store. Connect letters to form words and turn tiles in the hidden phrase. Each flipped letter brings you closer to solving the puzzle. Guess the phrase early to move on to the next level, or keep building words to flip all the letters for a special bonus. The high scores list lets you compare your game scores with players from around the world. New Flip Words features let players access boosts to improve their scores: Word Boost finds the longest word possible with the current letters and Phrase Boost reveals hidden letters in the phrase. Share your love of Flip Words with your friends! New social feature allows you to connect your game to Facebook and share the phrase you've just solved - can your friends guess the answer, too? One of the best word games of all time, Flip Words' unique feature of continuously updated phrases keeps the content fresh and the player engaged. Simple to learn gameplay, retro-styled graphics, catchy music and just the right sound effects, create a fun and exciting experience for players at all levels. 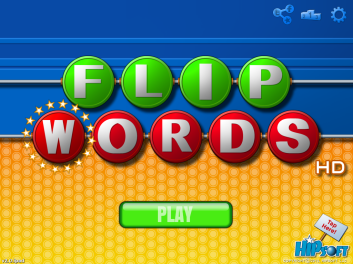 Flip Words HD 2.0 is $3.99 USD (or equivalent amount in other currencies) and available worldwide exclusively through the App Store in the Games category. 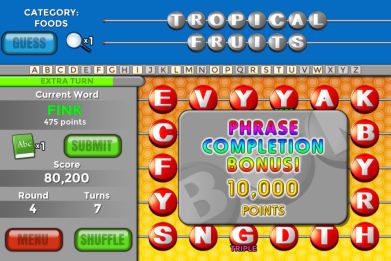 The price for Flip Words 2.0 for iPhone is $1.99 and requires iOS 4.3 or later. It is optimized for iPhone 5 and is compatible with iPhone, iPad and iPod touch. HipSoft LLC was founded in 2002 to create high quality, family-friendly games for the casual gamer market. 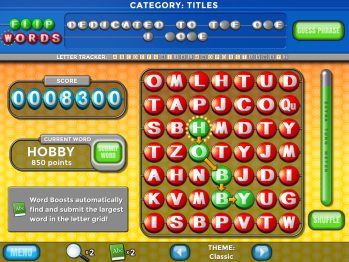 Among its award winning titles are the Build-a-lot series, the Puzzle Express series and Flip Words. Additional information about the company can be found at HipSoft online. All Material and Software (C) Copyright 2014 HipSoft LLC. All Rights Reserved. Apple, the Apple logo, iPhone, iPod and iPad are registered trademarks of Apple Inc. in the U.S. and/or other countries. Other trademarks and registered trademarks may be the property of their respective owners.